Alex Rodriguez, the popular New York Yankees third baseman, is no stranger to hip pain and surgery. A-Rod, as he is famously known, suffered from a hip condition called femoroacetabular impingement (FAI), which typically affects young and middle aged adults. 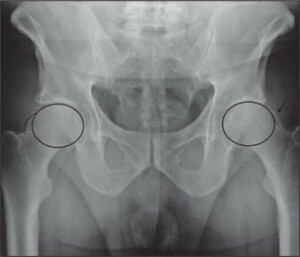 This condition is caused when the head of the femur is abnormally shaped and can become caught in the hip socket. This can also occur due to the rim of the socket sticking into the thigh bone. The grinding due to the abnormalities causes bone spurs to form and a labral tear to occur, which catch painfully on the joint. Rodriguez, as a young athlete, began to notice limited functional range of motion in his hip joint. This was due to his left femur becoming misshapen over an extended period of time. His hip was also not perfectly rounded, causing the bone to not fit securely in the socket. Our bodies try to make up for complications by compensating or overworking other areas. When this happens, we tend to focus on the problems created by compensation, rather than the underlying serious issue. Many patients with FAI end of undergoing spine injections or surgery for ongoing low back pain. Unfortunately the spine surgery doesn’t alleviate the pain brought on by the hip joint. In Rodriguez’s case, the compensation led to his first major hip injury in 2009. He suffered a second hip injury in 2012 that occurred due to the cartilage breaking down inside the hip joint. Rodriguez eventually underwent hip arthroscopic surgery to repair the torn labrum in his left hip in January of 2013. Hip arthroscopy can provide the patient with an improved range of motion. Rodriguez was fortunate that his cartilage damage was not too extensive, and he was able to complete rehabilitation and physical therapy. This allowed him to gain strength in his hip and teach the muscles how to work properly. Even though the surgery was successful, he was still put on a 60 day disabled list for the start of the 2013 MLB season. Two days before he was scheduled to go back to the Yankees in July, he suffered a Grade 1 quad strain, extending his disability time. Fortunately, he was able to resume playing ball in August. xcBefore having hip surgery, orthopedists generally recommend non-surgical treatments, such as rest, physical therapy, ice, NSAID’s and injections. If these treatments do not adequately control the pain and inflammation, hip arthroscopy is then recommended. In order to proceed with surgery, a physical examination and an MRI are done first to assess the patient’s health. The orthopedist will use tests and medical history to determine if any problems or health risks could interfere with the surgery. If so, a more in-depth evaluation will be conducted. Following the procedure, the surgeon will formulate a rehabilitation plan based on the type of surgery performed. In some cases, crutches are necessary. More extensive procedures might require crutches for one to two months. The complete recovery process is typically around five to six months in duration. Physical therapy, which involves case specific exercises, is necessary to recover strength and mobility.